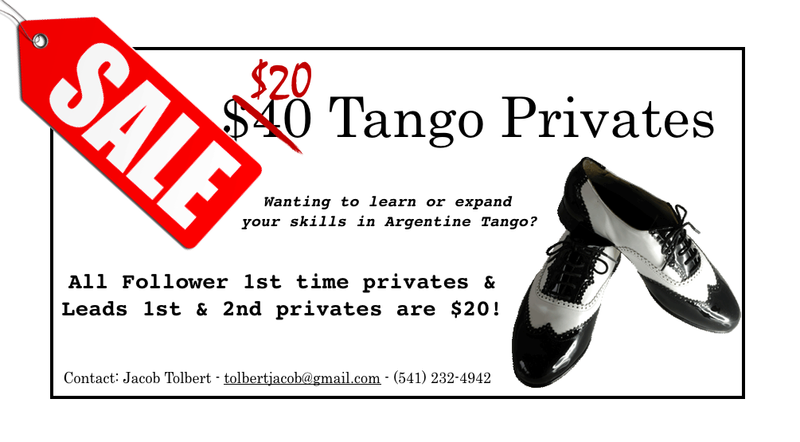 This page is dedicated to interesting tango news, upcoming events in Eugene tango, and Jacob’s schedule. It occurred to me at some point over the years that a community is comprised of a collective whose interests favor the progress and benefit to the individual, as well as, the group. The purpose of this survey is give the individual the opportunity to share their preferences on the type of classes visiting instructors will teach in the Eugene community. This is not all that formal of a survey, and you can consider this a trial. The impetus of this survey comes from past experiences with class organizing. Prior to their visit, visiting instructors typically ask the organizer to choose a couple classes from a host of classes that would most suit their community. I would be interested in seeing what the community would choose. The results of this survey will help guide my organizing of instructors in Eugene. Specifically, this survey can help guide instructors toward the community’s likes; then, I intend let the community decide on the classes the visiting instructors offer from the host of classes they put forward. A couple days ago I thought it was quite nice to be asked if I teach privates. I have been a bit distant on this matter, and only those who directly would ask would know that I regularly have been teaching privates for the last 2 years. In order to be more transparent on why I choose to present myself, now, I can provide two more reasons why I am acting in this manner. (1) I always have something to prove to others about Eugene tango. In October, we have Portland’s Tangofest 2012, then Javier & Kara coming, and the potential for many out-of-town dancers to visit, and I want for them to know and remember Eugene tango as being filled with friendly, skilled dancers. (2) I interact mostly with followers/women during privates, and there has been no shortage of comments on how they want for leads to improve. Therefore, I want to interact more with the leads, and I am hoping they find this offer enticing. Now don’t get me wrong, there are plenty of nice teachers here in Eugene. To figure out more about our teachers, milongas, and upcoming events, visit: http://www.eugenetango.com/events.do. I hope this all suits you well. Bridging the gap between intent and movement. This class will focus on building the qualities of intent and presence within walking and the embrace. Tapping the hidden potential of the self-generated pivot. This class will open our relationship to the body spiral and how this movement can increase our power and fluidity in everything from pivots and ochos ot boleos. Come out to Milonga de la Luna Azul on Saturday to see Janalee and Mike McCarrel Perform! Derrick del Pilar will be DJing, and it surely will be a lot of fun! The milonga is held at Studio B, 189 W. 8th Ave., and runs from 9:00-12:00p. Although quite overdo, a complete summary of the surveys are provided here! Click on the link to download the full report. The community conversation acted as a response to the survey results provided above. Click the link to discover how the community discussed potential changes for the future.